The Rocky franchise is one of the few that hasn’t lost its soul. There’s little virtue signaling and the first Creed movie, while another in an era full of spin-offs and sequels, delivered in an original way while remaining faithful to what made the series as a whole great. So I was pleased to hear that Creed II would be arriving and with it, the re-entry of Ivan Drago into the series. This time, he brought along his son, Viktor. It’s with the latter’s emergence that Adonis Creed, son of the late Apollo Creed, would have to face his father’s demons. There’s no running from legacy, as Adonis attempted three years ago. You might not care about it, but it cares about you. The timing of this formidable duo’s arrival was perfect, because they came immediately after what should have been Adonis Creed’s greatest moment of glory. Instead of a triumph that would secure his name, his victory was the thing that brought about the most foreboding challenge to his claim to greatness. If he couldn’t overcome it, his glory would be in some doubt. This spinning of fortune’s wheel – from triumph to heartbreak and an agonizing crawl out of the blood and mud of the latter – is what personified Creed II. Classical writers warned their audiences constantly to be mindful of the fickleness of fortune. It was a more pervasive theme in intellectual circles back then than it is today, much to our detriment. While we don’t talk about it, it’s very much present in Creed II. Ivan and Viktor Drago are the glue which holds the movie together. As villains, they’re impeccable. They don’t actually talk much, but when they do, you question whether they’re villains at all. Ivan Drago’s world turned upside down after his defeat in Rocky IV. His country and even his own wife abandoned him. All he had left was his son, Viktor, who he trained personally. Like his father, he turned out to be a beast – but a beast with vulnerabilities. 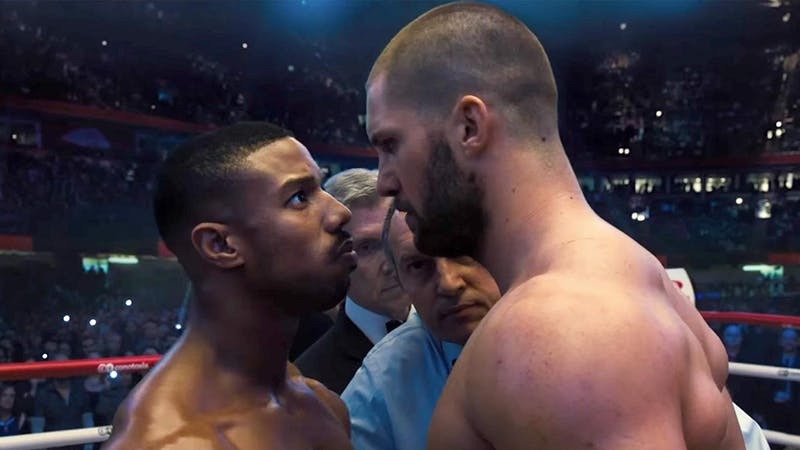 Throughout Creed II, we’re left with little choice but to feel bad for the Dragos – when they talk, that is (the contrast between their roles when speaking vs. when not speaking is one thing that adds a lot to this movie). Ivan Drago’s first appearance was meant to shine light on the ongoing Cold War, but now, he’s more human. His defeat indeed turned Ivan Drago from machine to man, and this is a nice touch for Creed II. The best villains aren’t always so clear cut and the genius of a war story is that neither side is entirely good or bad. One wonders whether Ivan and Viktor Drago could have been different if this wasn’t Adonis Creed’s movie. But Adonis Creed’s movie this was, and while fortune’s wheel, after 33 years, finally looks like it’s on the up for the Dragos, the title characters fortunes fall as soon as his great triumph at the beginning is over. Immediately, there are questions about how legitimate his triumph actually was, given the state of the opposition that he had encountered. That’s when the Dragos showed up and shattered his illusions. Sensing that his trainee was embarking on a path that he didn’t want to revisit, Rocky Balboa decided that he couldn’t join Adonis on this latest journey. This decision, and the falling out between competitor and trainer, would have dire consequences. It was a plot twist that I particularly appreciated, because it showed just how important to the series Rocky Balboa as a character still is. One might get the impression that the franchise has moved on from him, but despite the name, Creed II is still a Rocky movie, and that was great to see. One criticism I had in my mind while watching Creed II was the pacing. To me, a lot of stuff that apparently deserved more attention didn’t get enough time, while stuff that didn’t got too much time, or so I thought. While many months pass by in the blink of an eye, you realize at the very end that the pace was exactly what it needed to be. Around the time of the entrances of Adonis Creed and Viktor Drago for the final fight, you see before your very eyes that the movie all comes together. Keep in mind, however, that you might find the movie discordant throughout most of it until the end. When that end comes, you’re going to be elated at the heart-pounding action. My immediate impression of the final fight was that it was one of the best in the Rocky series. Perhaps that opinion will fade with time, but it was better than the fight between Rocky Balboa and Ivan Drago in 1985. What made the fight so good wasn’t just that Adonis Creed needed to prove himself as a real man in that battle. There was also a callback to what we saw in the original Creed vs. Drago fight in Rocky IV. When you get to this part of the movie, you will remember it. Let’s just get this out of the way first – Creed II wasn’t as good as the one from three years ago. Many of the supporting characters were weak. One sometimes wonders why Bianca and Mary Anne were there at all. This encouraged some of the pacing problems I mentioned earlier. The glue of the movie comes in the form of Adonis, Rocky, and the Dragos, and they make the difference. The brilliance of the Rocky franchise is that the movies challenge the hero to continuously rediscover his masculine virtue. Whether it’s overcoming age, complacency, or underdog status, the franchise tells the classic tale of the hero’s journey very well. With Creed II, the adversity Adonis needs to overcome is twofold – the haunting legacy of his father’s death in the ring, and his need to prove that he really deserves the honors that he’s been given. To do both of those things, he needs to defeat Viktor Drago, which is a tall, tall order. It’s here where Creed II delivers, and if you’re a fan of the Rocky series or the masculine ethos in general, it’s a movie I would recommend, despite its weaknesses.